Although the vast majority of automotive enthusiasts in the US have already seen pictures of the 2014 Chevrolet Camaro Convertible via spyshots, General Motors issued the first official pictures of the new droptop muscle car which is scheduled to make its public debut at the upcoming Frankfurt Motor Show. 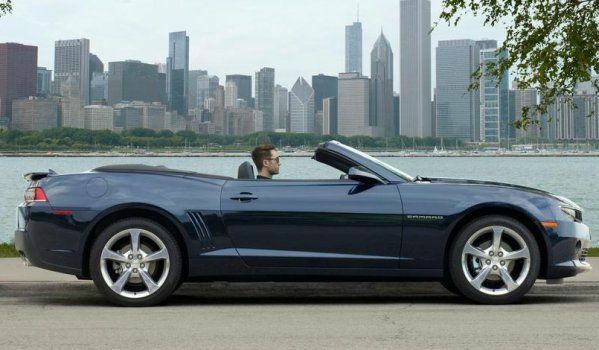 General Motors has issued two official shots of the new 2014 Chevrolet Camaro Convertible – one with the top up and one with the top down. We caught a new Camaro Convertible with the top up earlier this month (click here for those images from all sides) and based on the similarities, the soft topped Camaro that I caught could have been the “top down” image issued by the company. I blacked out the driver’s face in my images but honestly, it kind of looks like the same guy. In any case, these first official 2014 Camaro Convertible images don’t bring about any surprises…even if we hadn’t seen so many spyshots. GM designers have done a great job of transforming the coupe to a convertible with as few differences as possible, shy of the retracting cloth top. One key point when you look at the two GM images is that the Camaro SS and Camaro V6 models do have a slightly different front end along with the different hood as the SS models get the new vented hood design. 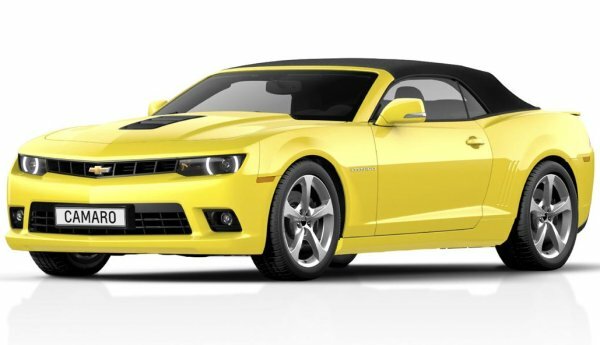 The yellow Camaro SS Convertible also has a shorter set of mirrors with what looks to be an LED turn signal indicator but that could very well be for the European market. This yellow Camaro also doesn’t wear SS badges even though it is clearly an SS as in Europe, the Camaro is only offered in what Americans would consider SS trim. European buyers have traditionally not been able to purchase the V6 Camaro. The 2014 Chevrolet Camaro Convertible will make its world media debut on September 10th at the Frankfurt Motor Show before the public gets to check it out starting on September 14th. Unless GM begins offering the 2014 Camaro in V6 trim for the European market, the specs unviled for the new Camaro Convertible in Frankfurt will only apply to the SS package but we wouldn’t be surprised if GM issued up a more US-friendly press release with full specs for American buyers. While some diehard Chevy fans will grumble at the fact that the 2014 Camaro Convertible is being debuted in Europe, it shouldn’t come as all that much of a shock. Back in March, GM used the Geneva Motor Show to publicly introduce the new 2014 Corvette Stingray Convertible and in their effort to promote vehicles on a global scale – it wouldn’t make sense to reserve every new model introduction to US auto shows.